1955 New Hampshire - $20.00 : Bob Hoyts Classic Inspection Stickers, Add a Final Touch to your Restoration! 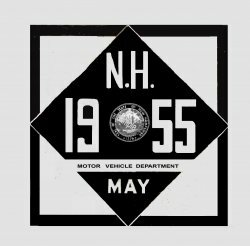 This 1955 New Hampshire Inspection sticker was displayed on the lower passenger side of the windshield. We would like to pay a fair price for any that you may want to sell us that do not appear on this site.